Advantages: A useful photographic reference. This useful little publication heralds a new series from Polish Publishers Kagero. 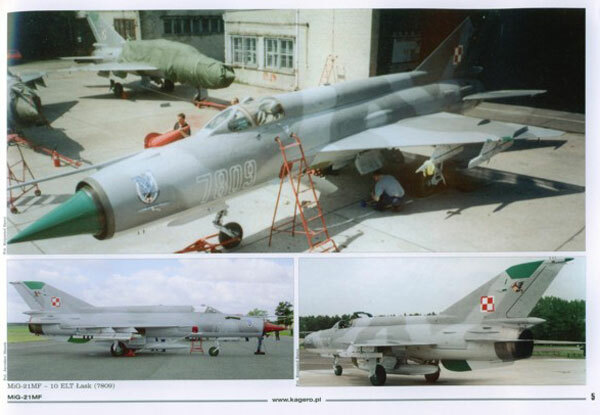 MiG-21MF is a photographic walk around book covering the Fishbed in Polish Service under series title “Topshots”. 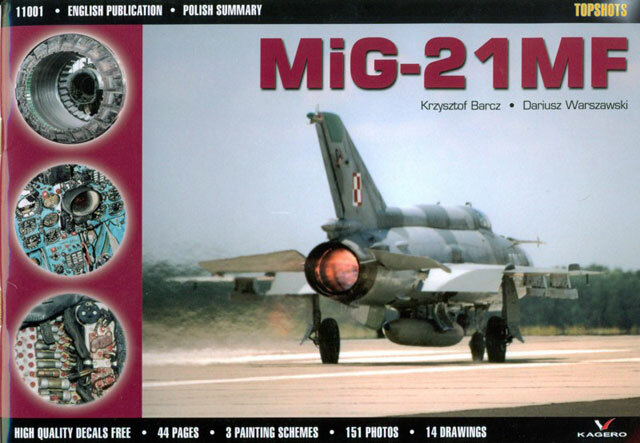 With last MiG-21MFs phased out of service in Poland in 2003, the authors Krzysztof Barcz and Dariusz Warszawaski, have taken the opportunity to compile this book to provide a lasting and detailed reference of the type. Complementing the myriad of colour photographs are extracts from manuals and technical drawings of items such as the ejection seat, cockpit controls and various bays on the aircraft. If a modeller was planning to build a MiG-21MF they would be silly to overlook this neat little A5 booklet as a reference. Accompanying the book, and common with other Kagero publications, is a neat decal sheet printed by Techmod. 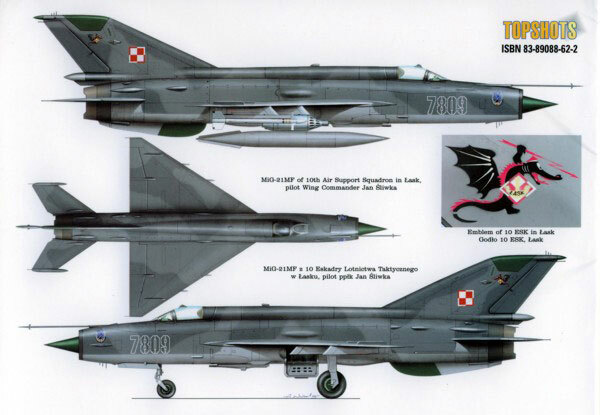 This provides markings for two aircraft including 7809, the aircraft flown by WGCDR Jan Sliwka of the 10th Air Support Squadron based at Lask. 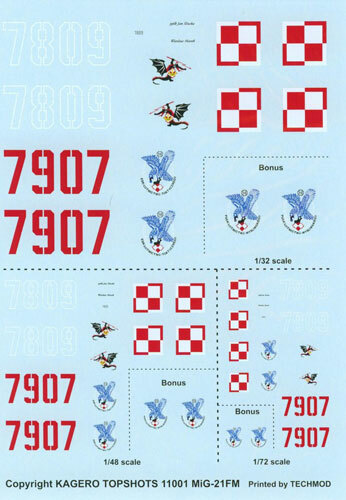 Features of these markings include a neat Dragon emblem for the base at Lask (worn high on the tail) and a diving eagle Squadron crest worn on the nose. This sheet is well printed and in register whilst the options are provided in all three major scales. 7809 is illustrated with photos in the book and in a three view drawing on the back cover for details of the three tone gray scheme, for anyone wishing to build it. Unfortunately I may have overlooked it, but I could not find the other option (7907) either in photo or drawing form in the book or any colour matches for the illustrated scheme so I am unable to comment fully on this aspect of the book. All photo captions are in English with a Polish summary provided. Despite the shortcomings with the decal sheet instructions the book itself will serve modellers well. Other “Topshots” titles include TBM-3 Avenger, Mi-24D/W and Bf-109G-6.